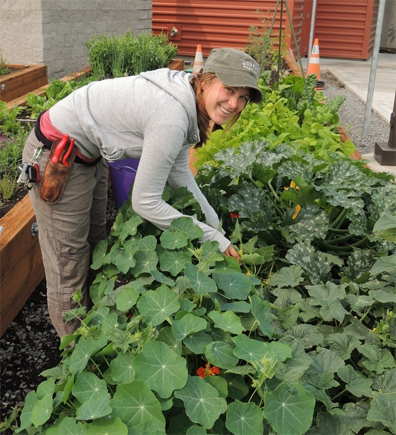 Growing their own: Here’s what 7 Bend restaurants are harvesting from their on-site gardens and serving up fresh for you! 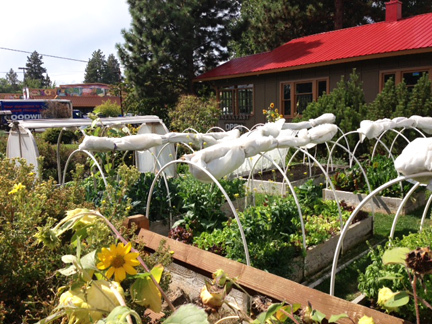 The amazing on-site garden’s at Bend’s CHOW restaurant. While Bend’s location in the mountainous high desert makes it a great spot for skiing and hiking, it’s not the world’s greatest location for agriculture. Our chilly nights and dry climate means our growing season is about 90 days long—about half what you get in rainy parts of the state like Portland or Eugene. But local gardens do yield some pretty impressive produce, particularly when they’re located on the grounds of some of Bend’s best dining establishments. Here’s what’s currently coming out of the ground and onto plates at some savvy Bend restaurants. This cozy little restaurant on Newport Avenue is one of Bend’s premier examples of locally-sourced, sustainable cuisine done right. Their impressive on-site garden provides much of the restaurant’s produce, with nine raised beds and an additional 400 square feet of garden area. Currently, CHOW is harvesting baby bok choy, purple haze carrots, a variety of greens, basil, kale, spinach, zucchini, and patty-pan squash. Check their specials board for seasonal offerings like the locavore omelet, seasonal salads, or a variety of Asian dishes starring the bok choy and carrots. Delicious veggie salad at CHOW, with ingredients straight from their garden! My favorite way to dine at CHOW is simply to ask my server to have the chef to surprise me (offering up any dietary restrictions/preferences beforehand, of course). I’ve never been disappointed, particularly this time of year when their garden is teeming with goodies. The scramble is a particularly good choice for breakfast or lunch, or ask for a salad prepared with all their garden bounty. They’re open for breakfast and lunch seven days a week. Worthy’s on-staff garden consultant, Lisa, tends to the veggies. One of Bend’s newest breweries is also one of the greenest, most agriculturally-focused. Worthy Brewing has its own hop growing yard, which doubles as a hop research facility for Oregon State University. Besides hops, they also grow a wide range of produce they use for creating tasty dishes in the kitchen. Right now, they have an abundance of cucumbers, zucchini, sorrel, basil, tomatoes, green onions, and cilantro. The tomatoes and cucumbers end up in a variety of salads, while the zucchini is a side dish accompanying the blackened salmon entrée. The herbs round out a lot of Worthy’s wood-fired pizzas. Ask your server about ever-changing daily specials, which always make good use of their garden veggies. If you swing by on a Friday night, don’t miss their prime rib special, which comes complete with an array of their own garden bounty. The Worthy IPA is my personal fave, so grab a pint to go with whatever you choose from the menu. These two Westside hotspots are adjacent to each other on Columbia Avenue, which makes it handy for them to share a lovely pair of gardens dubbed, “Herban Garden” and “Shasta Garden.” Ripe and ready for picking, they have broccoli, kale, dill, cilantro, and culinary herbs like chives, flowering oregano, sage, lemon balm and lovage. Their tomatoes and potatoes should be ripening in a few weeks. Most of the produce is distributed to employees in what they call their, “employee health plan,” but some of it ends up on the menu, too. The herb spiral shared by Real Food Street Bistro and Baked. Chef Michael McCann of Real Food Street Bistro uses the dill in the brine for his own housemade pickles served at this cute little street cart, and the cilantro and daikon radishes make it into the housemade kimchi. Baked. owner Gordon Benzer also uses gardening offerings in some of his baked goods, as well as preparing meals to serve folks who volunteer to work in the garden. Stop by for a loaf of bread at Baked. or a cup of soup at Real Food, then meander the gardens and admire some of the new additions like fruit trees and a bee box. 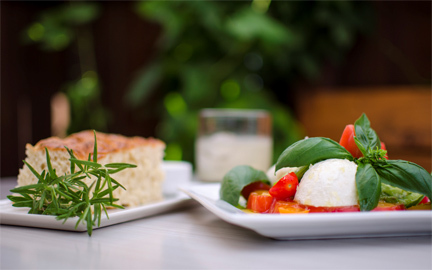 The foccacia and the caprese salad at Ariana’s both prominently feature their home-grown herbs. Arguably one of Bend’s best fine-dining options, Ariana Restaurant makes the most of its cozy patio with an impressive little herb garden. They currently have rosemary, sage, thyme, basil, lemon balm, lavender, and hops. Herbs like rosemary and thyme are used in the house-baked foccacia and with roasted meats like porchetta, which is served as a special from time to time. Lavender flowers are picked and dried and used in lavender ice cream (a current special) and the Provence cocktail, made with gin, lavender, and honey-infused syrup. The basil plays a starring role in the restaurant’s caprese salad, which is one of the best I’ve ever tasted. If the weather’s warm, let them know when you make your reservation that you’d like a spot next to the herb garden for an up-close-and-personal look at where your food comes from. Gorgeous herbs grow in the sunny courtyard at Jackalope. 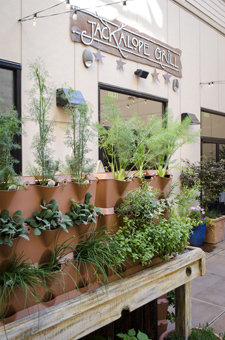 Another incredible fine-dining restaurant with an amazing array of fresh veggies and herbs, Jackalope Grill manages to fit a whole lotta garden into their little courtyard. Beautiful tiered planters and boxes feature lettuce, kale, cucumbers, and tomatoes, and Jackalope’s impressive selection of herbs go straight into the kitchen to produce fresh and unique cuisine. The garden boxes also help create some of the best ambiance you’ll find in outdoor dining around Bend. I’m a huge fan of the salads at Jackalope, and it’s easy to see why when you survey their garden boxes. Unique offerings like nasturtiums and shiso add a spicy kick to greens, and fresh herbs are earmarked for housemade dressings. Try their basil cucumber martini for a super-fresh cocktail option, then order a salad of fresh field greens to get things started right. Though it doesn’t come from their garden, I guarantee any of their beef-based entrees will leave you swooning. The Farmer’s Market cocktail at Dojo. While Dojo’s space in the middle of Downtown Bend doesn’t lend itself to the grow-your-own approach, they do have the advantage of being ten feet away from the Farmer’s Market on Wednesday afternoons. They make the most of this by browsing the market the moment it opens and creating a drink specials around whatever’s fresh that week. The lineup currently boasts a lot of peach and melon-centric offerings, so swing by for a mid-afternoon happy hour.